At the door, Marcus, who runs the place, spoke excitedly about a young folk-rock band from British Columbia, Shred Kelly, who’d played there the night before. A revelation, he called them. Got the whole crowd moving. So that would have worked, too. Blues isn’t the only music with healing power. But Josh Smith was on tap, and I felt confident he’d be a more than adequate lemonade maker. By now Smith, who’s based in L.A., has earned a reputation as a guitar player’s guitar player, and it has taken him to Europe, Asia and the yearly Keeping The Blues Alive at Sea cruise. When not touring, he appears at cosy, jazz-oriented L.A. venues like the venerable Baked Potato. So there’s some paradox going on here. Everybody seems to know Josh Smith, critics like him, guitar players love him … but you can still catch him in small rooms like the Yard Club, where roughly a hundred people came out on this Tuesday night. Somewhere during the course of his two generously timed sets, a question crossed my mind. Is it hard to decide what to play when you can play everything? With a crack rhythm section backing him in Cologne, Smith made his versatility work for him. He sampled all his most recent albums, demonstrating gobs of guitar wizardry and leaving no doubt that he can do it all. There was plenty of tastefully executed electric blues, some of it old-school, recalling B.B. King or Albert Collins, and just as many propulsive rock-oriented moments that saw Smith dancing with the ghosts of Jimi Hendrix and Stevie Ray Vaughan. I guess they’re old-school as well by now. There was funk in the form of “Letting You Go” and the instrumental highlight “Triple J Hoedown,” an astounding display of flat-pick virtuosity. Another instrumental, “Penance,” lives at the intersection of Roy Buchanan’s “The Messiah Will Come Again” and Gary Moore’s “Parisienne Walkways.” Smith knows he can always call upon this tune from his Inception record to stop a show. He let its exceptional beauty shine for the gathering at the Yard Club. “First Hand Look (At Down And Out)” was a tour-de-force of a different kind. The Over Your Head album featured prominently on this evening; Smith’s touring band had to be able to pull off hard-charging, riff-heavy blues-rock and pull it off they did. Drummer Felix Pollard (Lionel Richie, Phil Upchurch), perched square upon his stool, led the way with a dazzling show of dexterity and stamina. 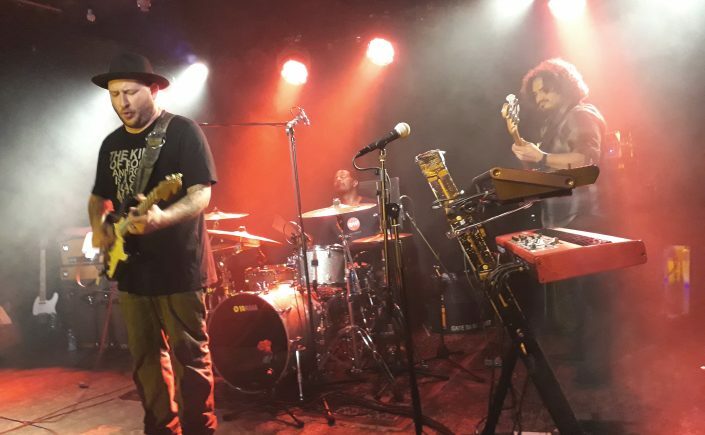 Long Beach jazz standout Nick Ornelas on bass and special guest Klaus Henatsch, known best as keyboard player for the German progressive hard rock band Nektar, were right there with him, from start to rousing finish. Nektar. That reminds me. What about the healing? Two days later on, I know my encounter with Murphy’s Law in the hours before the show still happened. But the sting is gone. Josh Smith and his fellow road warriors overshadowed anything bad or inconvenient that went down that day. They took my sack full of lemons, crushed them, squeezed them, removed the pits, added sugar and handed me back a tall, cool, soul-soothing refreshment. Hi Mike! Thank you very much for the feedback. This blog is still fairly new and I often have the feeling nobody is reading my stuff, so it’s good knowing you were here and actually took the time to the review of Josh’s show. See you soon!